If The Little School had rock-stars, it would be our Chefs. As the cart makes its squeaky way down the hallway, the kids often drop what they are doing and shout “Chef Justin! Chef Chris!”. I’m not exaggerating here. As I was leaving work last night, Chef Nate was returning to school to make homemade noodles for tomorrows lasagna. I asked if he knew that they carry such delicacies as noodles at the Food Lion, and he replied “Not for our kids. They get the best!” Trained at the Culinary Institute of America, our gourmet chefs have worked at The 5 star Fearrington House Inn, La Residence, and so forth. Do these kids KNOW what they have? Short answer… no, but let’s have fun and ask them what teh chefs do at school? Corn? 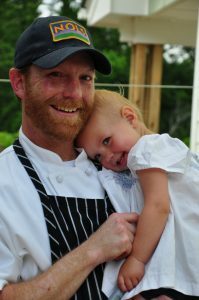 I repeat, these chefs comes directly from The Fearrington Inn, and “applesauce” is the best thing he makes (In Flurey’s – age 5 defense, his applesauce IS beyond amazing). Realizing that this is an overly conceptual questions for young kids, I move on to the teachers. The answers fly faster then a bowl of Nate’s tomato bisque…“spring rolls”, “anything with aioli sauce”, “homemade granola bars”, “ barbecue chicken and cheesy grits, “parmesan pop-overs” to name just a few. Drooling yet? No doubt, we are all eating well here at TLS! During lunch, the teachers sit and eat family style with the students. Older children serve themselves and pass the bowl to the next child. The teachers encourage the kids to talk about the food they are eating, and are guided through questions such as “how do you think a chick-pea grows?”, “what does this tomato soup remind you of?” Under the guidance of our very own green-thumbs, Leslie and Victoria, the classes plant and tend vegetable gardens that the Chefs use to prepare their sumptuous meals. The fresh, still warm bread, the vegetable gardens, even the lunch conversations are an extension of our curriculum. Think of it as another (really yummy) classroom. In this classroom we are teaching the children about food and how it arrives on their plates. This process encourages healthy choices, the joy of eating, and understanding when your body is finished eating. In an era of skyrocketing cases of obesity and diabetes in children, these measures are crucial for the life long health of our children. This is an idea that has received a great deal of press these days in part due to people like Jamie Oliver and Michelle Obama’s, “Let’s Move” campaign. Her goal is simple: to raise a generation of healthier kids. A large piece of that effort is helping kids make healthy eating choices. In speaking to the Grocery Manufacturers Association Conference, she called upon the industry to join the fight against childhood obesity by promoting healthy eating habits by rethinking the kinds of products they offer. This is the fundamental principle behind The Little School’s food program. It is often said that as a culture we have gotten very far away from truly knowing where our food comes from, and the effects it has on our bodies. A wonderful adage states, “If your grandmother wouldn’t recognize it as food, it’s NOT.” Teaching the children to grow their own food and to be exposed to a wide variety of delicious healthy options will help them make better choices for themselves. So sure, even if pizza day still reigns King, and even if congress says it’s so, our kids know pizza is NOT a vegetable! We would love it if you could join your kids for lunch one day and experience one of the coolest things about our school. I personally recommend the chicken and dumplings.